Chordomas are slow-growing malignant bone tumors that can occur anywhere along the spinal column, from the skull base to the tail bone. Chordomas are slow-growing malignant bone tumors that can occur anywhere along the spinal column, from the skull base to the tail bone. Chordomas are rare, accounting for only 1 percent of cancers of the central nervous system, but they are considered aggressive and have a high recurrence rate. Chordomas are thought to develop from remnants of the notochord, which is embryonic tissue. During fetal development, most of the notochord is replaced with the spinal cord. Sometimes, however, small amounts of the notochord remain, and, very rarely, these remnants can develop into a chordoma. A chordoma can occur at any age, although it is most commonly diagnosed in adults between 40 and 70. Chordomas, especially the types that appear at the bottom of the spine, affect more women than men. Childhood chordomas are extremely rare. Skull base chordomas are more common in younger patients; spinal chordomas are more likely after age 50. 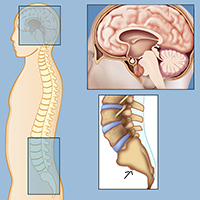 Different segments of the spine correlate with different parts of the body, and so a chordoma’s effects depend on where along the spine it occurs. The skull base includes a bone called the clivus, where about a third of all chordomas develop. Tumors there affect cranial and facial nerves and can affect vision. 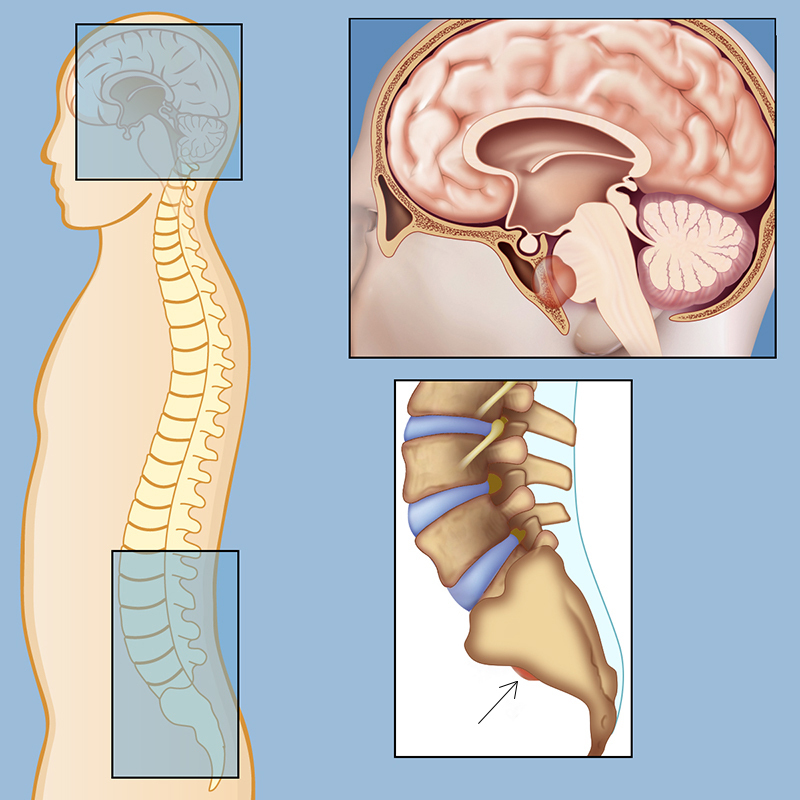 The cervical spine starts just below the skull and ends just above the thoracic spine. Its nerves branch off to the arms and upper chest. The thoracic spine is the mid-back. Its nerves branch off to the abdomen and chest. The lumbar spine is the lower back. Its nerves branch off to the hips, knees, ankles, and toes. The sacrum is the base of the spine and below that is the coccyx. A chordoma in this area can affect function of the legs, pelvis, bowel, and bladder. Chordomas can be grouped into different types by looking at a sample under a microscope. The three forms are conventional/classic, chondroid, and dedifferentiated. A conventional chordoma, also called classic, is the most common type. Under a microscope, a chondroid has certain features of a conventional chordoma and a chondrosarcoma, which is another type of cancer but one that derives from cells that produce cartilage. The dedifferentiated type of chordoma is the most aggressive form.